If you suffer from allergies and asthma, you know how important it is to keep your home as allergen-free as possible. Unfortunately, carpets are the worst offenders, trapping dust, dust mites, pollen, mold and dirt in surprisingly large quantities. This is true, even when they are vacuumed and deep cleaned regularly. Even tiled floors can capture dust, mold and other allergens in their grouting. But there is a solution: interior concrete flooring. In the last decade, concrete flooring has become an incredibly popular household flooring option for both indoor and outdoor spaces. With modern technology and creative product lines, you don’t have to be afraid that your home is going to resemble a large parking garage any longer. From glamorous, modern polished concrete to decorative concrete textures and colors, modern concrete that has been engineered to match any material. Concrete now even offers the beauty of stone, wood, and endless other possibilities. For allergy and asthma sufferers, concrete flooring will help keep your home more allergen-free than ever before. It’s smooth, impenetrable surface prevents mold and dust mites, and won’t trap any dust or dirt. It is also easy to clean with a simple household cleaner, ensuring that a regular dusting or mopping will remove all allergens from its surface. If you want your home to have expertly installed interior concrete flooring, our specialists at Artistic Concrete in Dade & Broward are happy to assist you in finding the right solution. With over 30 years of experience and a wide range of products including concrete stamping, decorative concrete, colored concrete patios, concrete driveways, Thin-Crete and Uro-Tile, we offer our clients expert services and high quality results at affordable prices. 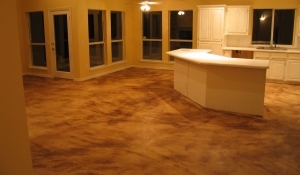 For more information and great concrete flooring ideas, please visit our gallery or contact us today.